2011 is 10 years + from the International Year of the Volunteers. So where are we 10 years on? Since 2001 there has been a significant shift in volunteering from a government perspective. This situation was particularly highlighted to the government during the 2000 Sydney Olympics. Some 47,000 people volunteered to support the running of the games and the sitting federal government really took notice of the economic value of these contributions. In the following years the Howard Government ramped up the outsourcing of community services to all range of organisations - most of whom were NFP with large numbers of volunteers. It is a political philosophy as to the responsibilities of state and the involvement of community, however it is my view that the federal government deliberately decided to let the community decide what was important by letting the community members fund those services directly. However, Melanie's point is that "volunteers are not free". And whilst the government may believe it has a windfall of free labour for services it used to have to fund, Melanie still wants to ensure that volunteers are used appropriately, paid labour is used when appropriate and appropriate value is assigned and captured for both. Australia has a long history of volunteering and yet in NSW, since the March 2011 State election there has been no appointed Minister for Volunteering and no allocated funding. Despite that we all do it, the State government must think that it is trivial and doesn't justify any recognition. Melanie wants to change all this. 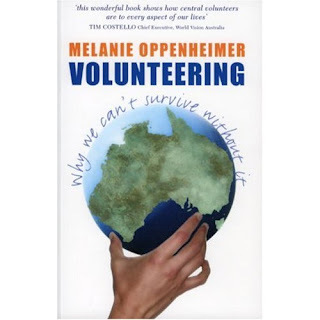 Melanie wants volunteering to have a central place in society. For the value of our volunteering to be included in the GDP and counted within our key labour force indicators. This is particularly of interest to women because women do more volunteering than men.And the UN considers the labour involved in low level farming, housework and volunteering to be "unproductive" - and it is this work that is more frequently undertaken by women. In Australia women's lives have changed dramatically, and whilst we are not undertaking subsistence farming it is time that the volunteering work done by women was recognised and valued accurately. 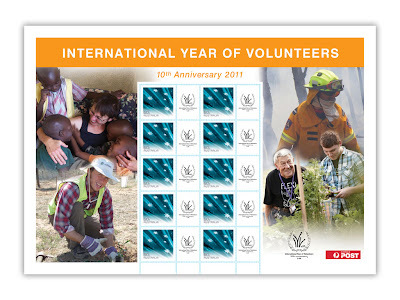 Melanie wants our national accounts to expand their coverage; for the national Census to expand its questions on volunteering; for the media to provide more coverage of volunteer events and issues; she wants Australia Post to change these stamps. I hope I have given you a taste of Melanie's work. She spoke with passion and enthusiasm. She has a clear vision and supporting action plan. She has a positive mindset for what is possible for volunteers - like you and me - here in Australia. If you are interested in Melanie and her work you can read her book: Volunteering: why we can't survive without it. And then you can think what YOU want out of your volunteering and how you are going to best contribute your time. Volunteering Australia is working to collect valid data on this subject from volunteers like you and I. GO AND DO THEIR SURVEY NOW! It is open until 6 November 2011. Take the opporutnity to reflect on your own volunteering whilst providing some free data for the cause - cause that's what you do when you're a volunteer at heart! Walt Disney World 40th Birthday today!